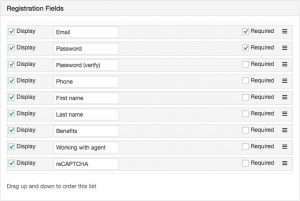 Create a highly configurable registration form. Use the shortcode [rover_idx_register] to display it in a widget, on a page, or in a footer. When a visitor fills out and saves the registration form, their information is also saved to your list of contacts. If you use the abbreviated registration form, the saved search created on their behalf is the last search they executed before registering. Click on the parameter link for more information.